Two channels of Class A Vintage-style preamp. The Miktek™ MPA-201 dual channel, Class A microphone preamplifier provides a pristine signal path with a sweet and linear response that will please the most sophisticated listeners. With 70 dB of gain, 48-volt phantom power and variable impedance selector, the Miktek MPA-201 highlights and enhances the best attributes of any microphone. Each channel boasts a large analog VU meter that can be switched from input to output, plus an LED Peak output meter, making it easy to set a good level. 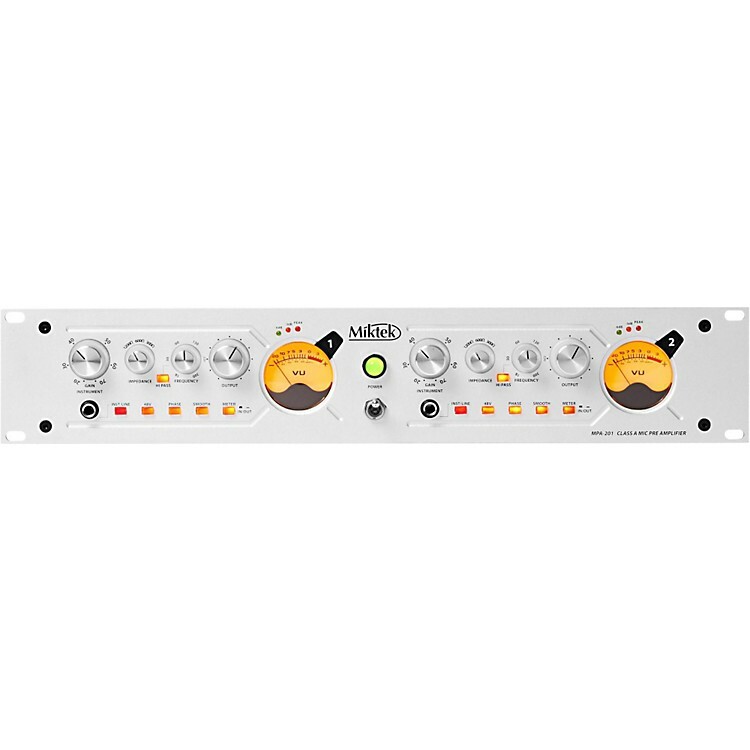 It also features a Phase switch and variable High Pass Filter, which allows you to reduce unwanted low frequencies in your recording and help reduce stage rumble in live sound applications. The MPA-201 preamplifier additionally features discrete transistors and six Miktek custom transformers. It features Direct Inputs on each channel, through a dedicated transformer for recording instruments like guitar, bass and keyboards. Perfect for adding a world-class signal path in front of your digital recordings. Order today and make the most of the mice you have.